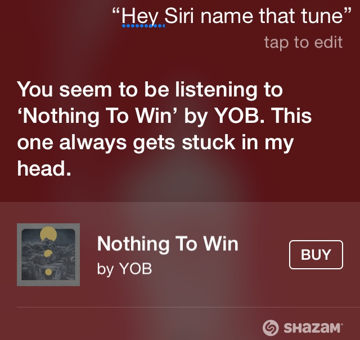 Since Wednesday's launch of iOS 8, Apple appears to have flipped the switch on the new Shazam-powered song recognition feature. Earlier in the week, the cloud-based function was not yet available. But as of Friday, users can now ask Siri to identify the song playing, and the voice-driven personal assistant will attempt to recognize it. 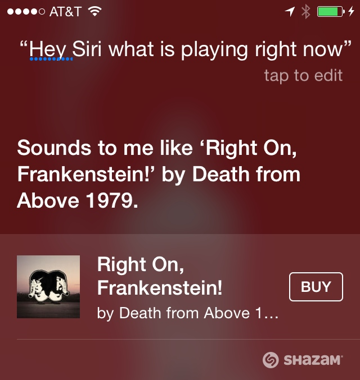 Siri responds to inquiries such as "What song is this? ", "What is currently playing? ", and even, as noted by The Loop, the command "Name that tune." Siri responds to the inquiries with her usual humorous style, with a variety of responses possible. In our tests, she said one of the songs always gets stuck in her head. Of course, this functionality also works with the new "Hey Siri" handsfree mode available in iOS 8, allowing users to invoke the feature without touching their iPhone or iPad as long as it is plugged in to external power. Also since Wednesday's launch of iOS 8, Apple has also enabled from its servers the ability to respond to HomeKit-related commands. 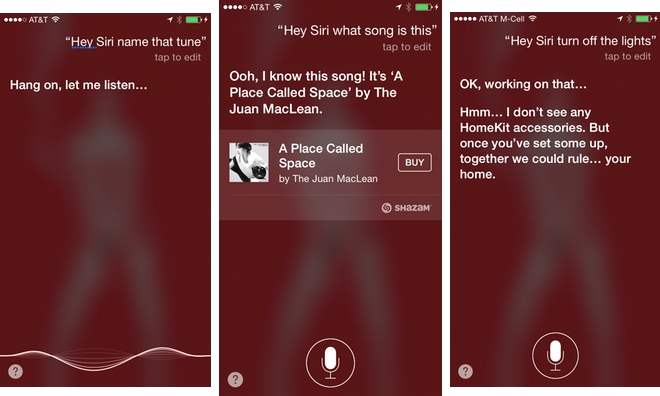 If a user doesn't have any compatible apps or connected accessories available, Siri lets them know that the capabilities will work once their home is appropriately equipped. Friday also happens to be "International Talk Like a Pirate Day," and, aye, Siri even recognizes this holiday.